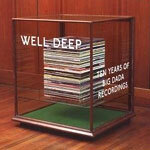 2 cd's and 31 tracks celebrating the 10 year anniversary since Big Dada's inception. Home of some of the most maverick, forward-thinking and innovative artists in hip-hop and beyond, think of it not as a best of but more like a carefully handpicked selection that defines the label's mission statement. Featuring tracks by Diplo, Roots Manuva, Busdriver, NMS and much more!